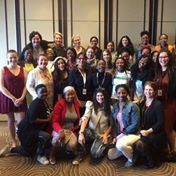 During the 2016 Durban International Film Festival, women making films and television (both locally and internationally) came together to address common concerns, share experiences, support and inspire one another. Everyone in attendance supported the importance of working towards ensuring that women are given a voice in the industry, through organized action. It was agreed that there will be different chapters of this organization in the making that would meet to work out a way to set up such an organization and begin to define what it should do. Other meetings will take place in Johannesburg and Cape Town. See below for details. All women working in the film and television sector are invited to attend the inaugural meetings in the various cities. Compile of list of what everyone feels is needed from an organization like this. Try and expand the groups to include as many women as are interested – with a view to possible splitting groups up around shared interests if they get to big. get everyone to like the Facebook page: https://www.facebook.com/WomenMakingFilmsSA/. Choose or elect if necessary one ( or max 2) people who will be the coordinators of the group. This job will include liaising with everyone nationally as well as planning all subsequent meetings and ensuring momentum isn’t lost. Allow time for networking, and problem solving around issues that are raised. Plan a time and venue for the next meeting Thursday 11th August. Please feel free to submit any additional items for the agenda to Tiny Mungwe and these will be proposed at the beginning of the meeting.